Society for the Blind, a Sacramento-based nonprofit serving blind and low vision people in Northern California, has received a grant from Anthem Blue Cross and CareMore Foundations to create opportunities for individuals to participate in the National Fitness Challenge, an initiative founded by the United States Association of Blind Athletes and the parent Foundation of Anthem Blue Cross and CareMore. Society for the Blind is one of 17 organizations across the nation that is participating in the National Fitness Challenge and is using grant funding to offer adaptive yoga classes, walking groups, running clinics and other sports and fitness activities that can help people who are blind or low-vision to maximize healthy lifestyles. These activities will be offered over the course of eight months to help hundreds of youth and adults to increase physical fitness levels and live healthier lives. This year’s challenge integrates technology and social media to inspire participants to set goals, create team environments and encourage leadership. Each participant has been provided with a Fitbit Flex 2 wearable – a universal way to measure activities, calories burned and number of steps taken. Participants also have the opportunity to utilize Fitbit Coach, which is a personalized training app that provides adaptive video workouts and audio coaching. Foundation grant funding is being used to provide Fitbits, fitness and nutritional instruction, performance prizes as well as technical and financial support for all participants. More than half of those who are blind or low vision in the United States do not participate in even a limited physical fitness routine, mostly due to barriers to accessible fitness or misconceptions about their abilities. Individuals of all abilities should have equal opportunities to engage in activities that improve health outcomes, so the National Fitness Challenge aims to increase access to fitness and health for blind and low vision people. 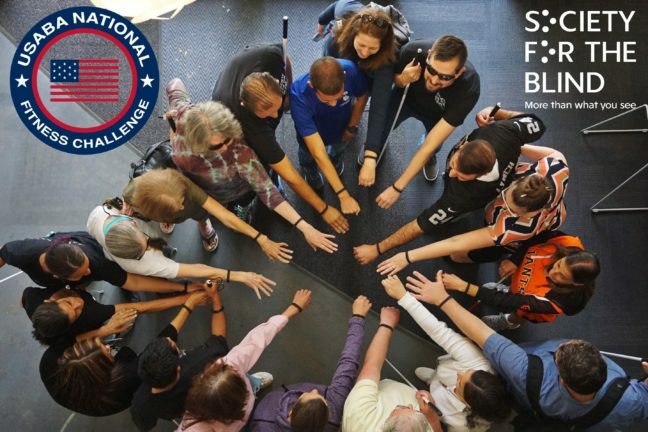 Since 2011, the parent Foundation of Anthem Blue Cross and CareMore has provided $1.3 million in grant funding to U.S. Association of Blind Athletes for the National Fitness Challenge initiative and has impacted thousands of Americans with visual disabilities by partnering with 40 different agencies across the country. To learn more about the National Fitness Challenge, visit www.usaba.org/NationalFitnessChallenge. For more than 60 years, Society for the Blind has created innovative ways to empower individuals living with low vision or blindness to discover, develop and achieve their full potential. Society for the Blind has grown from a dedicated group of volunteers to a nationally recognized agency and the only comprehensive rehabilitative teaching center that provides services for a 27-county region of northern California. The nonprofit provides low-vision eye care, life and job skills training, mentorship, and access to tools to maintain independence for more than 5,000 youth, adults and seniors experiencing vision loss each year. For more information: SocietyfortheBlind.org. Through charitable grant making, the Anthem Blue Cross Foundation LLC, an independent licensee of the Blue Cross Association promotes Anthem Blue Cross’s inherent commitment to enhance the health and well-being of individuals and families in communities that the company serves. The Foundation focuses its funding on strategic initiatives that address and provide innovative solutions to healthcare challenges, as well as promoting the Healthy Generations Program, a multi-generational initiative that targets specific disease states and medical conditions. These include: prenatal care in the first trimester, low birth weight babies, cardiac morbidity rates, long term activities that decrease obesity and increase physical activity, diabetes prevalence in adult populations, adult pneumococcal and influenza vaccinations and smoking cessation. The foundation also coordinates the company’s year-round Associate Giving program that provides a 50 percent match of associates’ pledges, as well as its Volunteer Time Off and Dollars for Doers community service programs. ®ANTHEM is a registered trademark of Anthem Insurance Companies, Inc. The Blue Cross names and symbol are registered marks of the Blue Cross Association. The CareMore Foundation is the philanthropic arm of CareMore Health, a wholly-owned subsidiary of Anthem, Inc. Together, with local, regional and national organizations, the CareMore Foundation works to enhance the health and well-being of individuals and families in the communities that CareMore serves. CareMore Foundation funding is focused on strategic initiatives working to address and provide innovative solutions for complex health conditions like diabetes, chronic obstructive pulmonary disease, and congestive heart failure, and those promoting prevention and healthy aging. It also supports programs and initiatives addressing social determinants and barriers to quality care. CareMore Foundation also promotes the Healthy Generations Program, a multi-generational initiative with five areas of focus: Healthy Heart, Cancer Prevention, Healthy Maternal Practices, Type 2 Diabetes Prevention and Healthy Active Lifestyle. © Kristin Thébaud Communications. All rights reserved.